Saving America and the World by Slashing US Military Spending - This Can't Be Happening! By all accounts, the US accounts for more than a third of all global military spending. Chine, the second biggest spender on its military, only spends a fifth as much as the US. And remember, as a full-fledged police state and a country whose peripheral provinces have to be kept under tight military control lest they move towards independence from Beijing, much of China’s huge military is actually involved not in threatening other countries or even defending China, but in maintaining government control domestically. Russia’s military spending, which actually declined last year, spends less than tiny Saudi Arabia, which can’t even control even tinier neighboring Yemen without vast assistance and military aid from the United States. That reality is that it is the US which is the most threatening and destabilizing force in the world today. It is US military spending, and the US role as the world’s largest arms merchant, selling and giving away more than 34% of all weapons and military equipment in the global arms market to a total of 98 countries, that drives global military spending. Russia, at a puny 22% of all arms sales, is distinctly second rate in the world arms market. None of these weapons sales by the US make the world a safer place. They all, along ever-increasing spending by the US on its own military, and its continuing use of that military to intervene in, invade and threaten other countries, contribute to the hugely costly and harmful effort by other nations to build up their own military in response to the US and its client states. The losers in this zero-sum game of one-upmanship are the peoples of the world, who are denied good schools, decent health care, sound economies, democratic governments, modern transport systems, and perhaps worst of all, spending on environmentally safe development of energy infrastructure that could prevent the destruction of the entire global ecosystem. And that includes us, the people of the United States. Deliberately frightened by the amped up propaganda pumped out by government agencies like the Pentagon, Homeland Security and the Justice Department, we cower and accept having more than 54% of all federal discretionary spending — a sum that has reached over $1.6 trillion this year, equal to all income taxes and corporate profit taxes collected by the IRS — expropriated by the Pentagon and other “national security” agencies. That is money that could be providing us with a first-rate educational system, free college for all who desire and qualify for higher education, a modern transit system, revitalized cities, and a modern energy system based on the non-carbon-based sources like solar power, water power and geothermal power that would not contribute to rampaging climate change. Instead we have a school system that makes me cringe whenever I drive past a school building here in Philadelphia (the nation’s fifth largest school district) or in New York City, or when I read that only 12 percent of Los Angeles’s public school children go on to college. It is simply madness that has led us to this point. Madness by a ruling elite that only cares about grasping an ever larger share of the national and global wealth, madness by a corporate media that care only about gaining an ever larger share of readers/viewers even if that is achieved by offering people scare stories about health threats, crime, scary immigrants and terrorism instead of genuinely needed reports on environmental threats, political corruption and America’s true role as a rogue nation in the world, and madness among a public that has been led to believe that it has no real ability to change things except to go meekly to the polls once every two or four years to vote for carefully screened candidates of two parties controlled by corporate bribes. Why is this so? 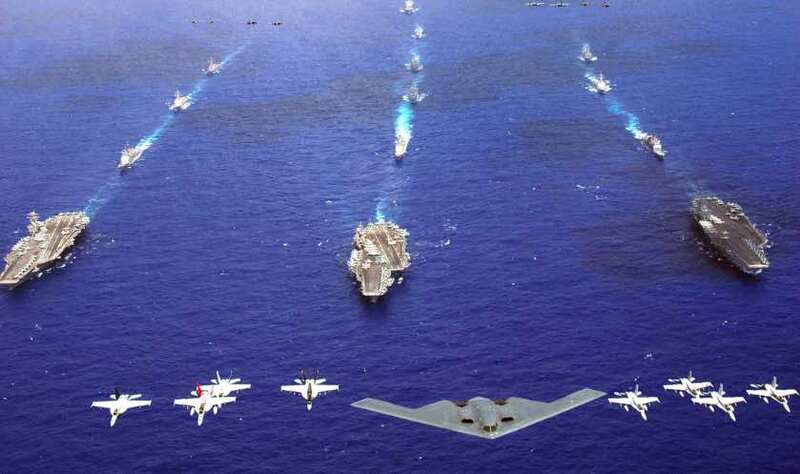 Because the US has become essentially a garrison warrior state — a kind of modern Sparta, obsessed with concepts like “global dominance” or the latest Trump-era strategic catch-word “overmatch,” the supposed ability to “fight and win two wars at once” (fully disproven over the past 74 years of lost and stalemated wars), with “force projection” and dreams of achieving “technological superiority.” We have become a country that lionizes generals, that uncritically applauds uniformed men and women walking through an airport waiting hall, that calls all its problematic police officers “heroes,” but that ignores its real heroes: the teachers, nurses, EMT personnel, volunteer firefighters, mail carriers, nursing home aides, artists, highway repair crews and yes, even journalists — the lowly folks who really keep the country going and make our lives possible. If we don’t turn this situation around, renounce our obsession with violence and with war as the preferred solution to international disputes, not only will this country go the way of Sparta and Rome — both powerful states that died of self-inflicted wounds — but we will likely drag the rest of the world with us into oblivion. The latest reports on the climate front are grim. It turns out that the world’s oceans have been for decades masking the real heating up of the globe that has been the result of humanity’s — and especially US Americans’ frantic appetite for burning ever more coal, oil and gas in pursuit of goods, comfort, speed, wealth and power, absorbing as much as 93% of all the additional heat trapped by increased greenhouse chemicals in the atmosphere over the last two centuries. Now the seas have taken on about all the extra heat they can, and we are likely to start seeing the atmosphere itself heat up dramatically. The North polar region, we know, is soon to lose its entire ice cap in summer, perhaps in a few years but in any event no later than 2030. No less an agency than the US Naval Institute, with it’s respected climate study department, is saying this. In fact the Navy is being given funds by a hypocritical Congress of climate change deniers to establish a whole new Naval Fleet in the Arctic Ocean to “project power” in that newly navigable seventh of the famed Seven Seas, the better to allow US energy corporations to extract even more dangerous oil and gas reserves from under the newly ice-free sea bed safe (at taxpayer expense) from challenges by competing countries with Arctic coastlines like Russia, Canada, Norway and Denmark/Greenland. Meanwhile in Antarctica, where there is enough stored ice on land to, if it melts, raise the world’s seas by almost 200 feet, the latest reports are that the ice there is melting all over the continent, not just in the western region, and that it is melting some six times faster than scientists had thought until now (even climate change-denying Fox TV is now reporting on this looming catastrophe). There is an urgent need for the US, and for the people of this self-described “indispensable” nation, to wake up from our torpor, to throw off our fear-induced and greed-driven obsession with military spending, and to turn both inward to the need to develop a humane and sustainable society that benefits all its members, and outward to become a cooperative and non-threatening member of the global community of nations so we can together tackle the grave challenges to global survival that our remarkable but at the same time often aggressive, emotionally volatile and short-sighted species has caused. I suggest that for a start, we the American people demand that our government, in open public Congressional hearings, subject the Pentagon and all the other “national security” agencies of the federal government — the CIA, Homeland Security, the National Security Agency, the Interior Department, the Energy Department, etc. — to a rigorous process of zero-budget accounting, in which ever dollar being requested has to be justified before it can be appropriated and billed to taxpayers. It’s a process long overdue. The Pentagon, for the last 28 years, has been obstinately refusing a Congressional mandate to produce an auditable budget. When it was finally forced by Congress last year to submit to one, it failed abysmally. As I wrote in a Nation magazine cover story last month, the Pentagon has been submitting fraudulent financial reports to Congress for nearly three decades, so we can’t even know what they have spent all our tax dollars on for decades, or even how much they have actually spent! That should outrate everyone, regardless of their political views. Only by making the Pentagon and the other so-called “national security” agencies defend their budget requests line by line and dollar by dollar can we really ever decide in a rational manner what we want to spend our money on. Only then can we weigh the $150 million cost of a single F-35 fifth-generation fighter-bomber against the opportunity lost of funding a new high school or hospital, or the cost of another aircraft carrier battle group against the opportunity lost of a new high-speed rail line linking New York, Chicago and Los Angeles or a subway, instead of just two miles of abandoned tunnel, for Cincinnati. If China, a nation of 1.3 billion fractious people living under an iron-fisted dictatorship, can get by with a military budget of just $174 billion (considerably less than the $198 billion US will spend this year on just its Veterans Affairs budget to care for the damaged troops from its endless wars), surely this relatively domestically tranquil nation could do the same, slashing its military spending by 80-90% or more. Want to “make America great again”? The way to do that is not to ramp up military spending as the current administration and Congress are doing, but rather to end our wasteful spending of over a trillion dollars a year on arms, war and so-called “national security” and to instead spend this huge totally wasted share of our national wealth on our own long neglected social needs and on saving this country and world from an increasingly obvious looming environmental catastrophe.